Fruits and vegetables boost happiness even quicker than health. Eating 8 portions of fruit and vegetables a day provides the maximum boost to people’s happiness, new study finds. The positive effect comes faster than the boost to health. 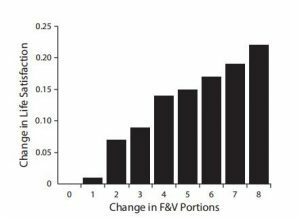 Up to 8 portions, the more portions people ate, the happier they were. The effect on happiness of eating those 8 portions compared with none was dramatic. In terms of life satisfaction, it was equivalent to the difference between being employed and unemployed. The graph below shows the increase in life satisfaction with portions of fruit and vegetables consumed each day. 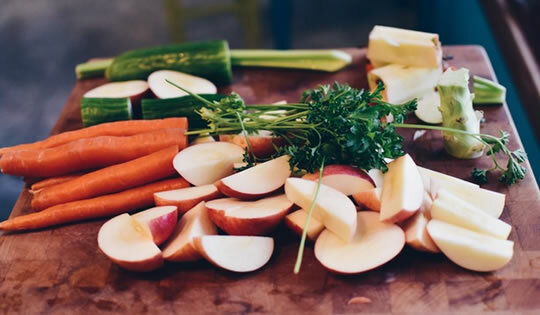 It is the first time a large study has found that fruit and vegetables contribute to happiness on top of their well-known protective effect against cancer and heart disease. “Eating fruit and vegetables apparently boosts our happiness far more quickly than it improves human health. People’s motivation to eat healthy food is weakened by the fact that physical-health benefits, such as protecting against cancer, accrue decades later. The conclusions come from following over 12,000 people. Participants kept food diaries and their psychological well-being was measured. Within two years, those eating more fruits and vegetables felt better, the results showed. “Perhaps our results will be more effective than traditional messages in convincing people to have a healthy diet. One possible mechanism by which fruit and vegetables affect happiness is through antioxidants. There is a suggested connection between antioxidants and optimism. The study was published in the American Journal of Public Health (Mujcic & Oswald, 2016).